Telling us what was happening. Telling was going on when you did something else. Learn to talk about food, and talking more at ease using pronouns. You already can tell what you did yesterday, last week... and so on. start talking like a native: light up your conversation (your responses) using pronouns instead of long sentences. 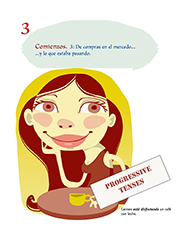 talk about your favorite meals; learn about eating habits in the Spanish speaking world.